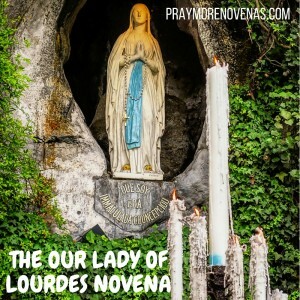 Here’s the Final Prayer of the Our Lady of Lourdes Novena! Dearest Jesus and Mary, please protect and heal my family and I. Please heal us Spiritually, mentally, physically and emotionally. Please heal us of depression, anxiety, diabetes, heart disease, fibromyalgia, TMJ, sciatica, colon problems and arthritis. Dear God, please heal my family and I Spiritually, physically, emotionally and mentally. Please heal my cousin from her colon surgery. Dear Jesus and Mary, please keep safe and healthy my family and I. Please heal us Spiritually, mentally, physically and emotionally. Please heal us of diabetes, depression, anxiety, allergies, asthma, heart disease, TMJ, arthritis, sciatica and colon problems. Please watch over my cousin today during her colon surgery. Dear Lord, please heal and protect my family and I as we strive to live each day by Your Word. Dear Jesus and Mary, please protect and heal my family and I. Please Bless us Spiritually, mentally, physically and emotionally. Please heal us of diabetes, depression, anxiety, asthma, allergies, TMJ, heart disease, arthritis, fibromyalgia and sciatica. Thank you God, for all your blessings. God is good. Dear God, please protect and heal my family and I Spiritually, mentally, physically and emotionally. Dear Jesus and Mary, please heal and keep safe my family and I. Please heal us Spiritually, mentally, physically and emotionally. Please heal us from depression, anxiety, diabetes, heart disease, TMJ, fibromyalgia, arthritis, colon problems, asthma, allergies and sciatica. Dearest Jesus and Mary, please keep safe and heal my family and I. Please heal us Spiritually, mentally, physically and emotionally. Dear Lord, please protect and heal my family and I. Please heal us of diabetes, depression, anxiety, heart disease, allergies, asthma, arthritis, TMJ, sciatica, colon problems and fibromyalgia. Please heal us of depression, anxiety, diabetes, heart disease, sciatica, allergies, asthma, arthritis, fibromyalgia and TMJ. Dear Lord, please keep our family safe and healthy. Please help us make good choices in your name. Please lead us towards those who may bring us closer to you. Dear Jesus and Mary, please heal my family and I Spiritually, mentally, physically and emotionally. Please heal us of diabetes, heart disease, asthma, allergies, diabetes, depression, anxiety, fibromyalgia, colon problems and arthritis. Please heal our son of his upper respiratory infection. Dear Jesus, thank you for the many blessings you have bestowed upon my family and I. Please continue to provide the and heal us Spiritually, mentally, physically and emotionally. Dear Lord, please protect and heal my family and I. Please heal us of fibromyalgia, sciatica, depression, anxiety, allergies, asthma, diabetes, heart disease, arthritis and colon problems. Thank you for hearing our prayers. My daughter’s stem cell transplant has been going so much better than we anticipated and she is in really good shape and getting better. Thank you for bringing her healing. Dear Jesus and Mary, please heal my family and I. Please heal us of diabetes, depression, anxiety, heart disease, TMJ, arthritis, fibromyalgia, allergies, asthma and colon problems. Dear Jesus and Mary, thank you for hearing my prayers and keeping me safe during my catheterization procedure yesterday. My cardiac tests all went well. Please continue to keep my family and I safe and healthy. Please heal us of depression, anxiety, fibromyalgia, heart disease, diabetes, allergies, asthma, colon problems and arthritis. Dear Jesus and Mary, please heal my family and I. Please protect me today during my catheterization procedure. Please heal us of heart disease, fibromyalgia, arthritis, depression, anxiety, asthma, allergies, diabetes, TMJ, sciatica and colon problems. THANK YOU our Lady of Lourdes for hearing our prayers and concerns. I want to give a SHOUT OUT to..
Father Lombardi he was fascinated with our Lady of Lourdes. PRAY YOUR ROSARY EVERYONE !! Dear Jesus and Mary, please keep safe and heal my family and I. Please heal us Spiritually, mentally, physically and emotionally. Please heal us of heart disease, diabetes, asthma, allergies, depression, anxiety, TMJ, sciatica, fibromyalgia and colon problems. Lord I pray for money to meet all my financial obligations. I pray for financial deliverance today.